Namsan may be more famous these days as a place for amorous couples looking to express their love through the (now) unoriginal love locks at the Seoul Tower but for many Seoulites, Namsan has long been famous for the cluster of eateries at the base of Namsan serving wang (king) donkatsu. 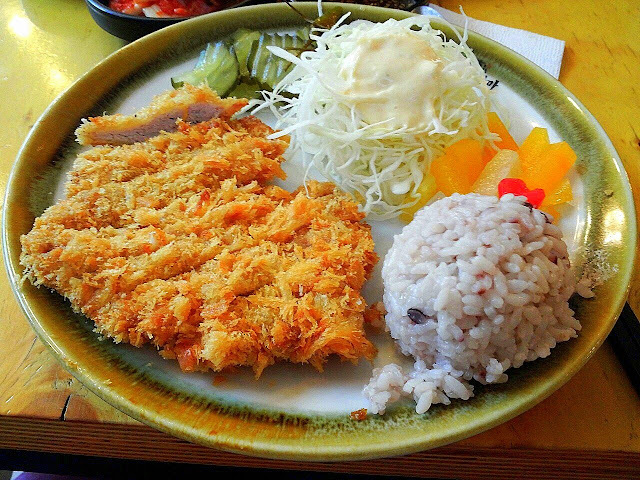 Unlike its thicker counterparts from Japan, wang donkatsu in Korea is bigger, thinner and the breadcrumbs in its coating smaller. Wang, after all, means "king" in Korean and is often used in the names of dishes and foods that are quite sizable than usual (wang mandu, wang shrimp, etc). Some of the establishments here have been around for decades with my father and his friends even telling me previously they ate around here when they were young. I, myself, also recall coming here on a few occasions as a kid and was always giddy seeing the sheer size of these fried and breaded pork patties. Starving after a long run a few weekends ago, my roommate and I was in the mood for some donkatsu and we came to remember the donkatsu cluster at nearby Namsan and decided to hit it up. I was torn between going to the regular OG places I knew of from my parents but was also intrigued by this Minamiyama place which, based on reviews, was a relatively newer (1996) but popular donkatsu place. User reviews I have found, especially from Korean mobile apps like Wingspoon, can often be dubious at best but we decided to go out on a limb and go. As soon as you approach the cluster of eateries around here, the various parking lot staff will rush out to try and get your vehicle to come to their own establishment. I had read there were often lines on weekends at Minamiyama and was a little worried but luckily we were seated right away. In addition to the donkatsu here, Miniamiyama also specializes in its udon and ramen. 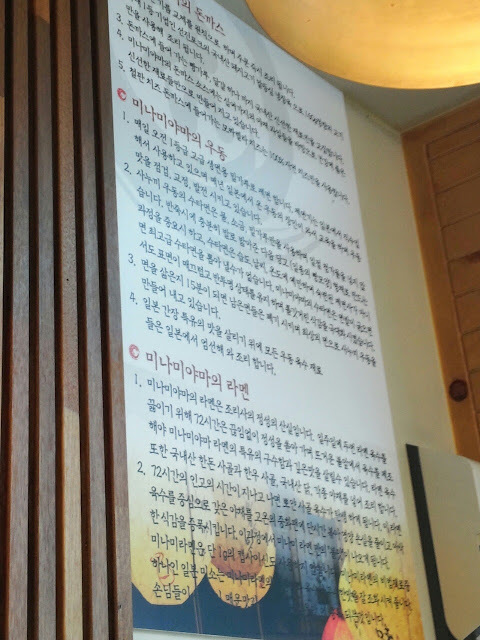 The big signs posted on the walls make a lot of reassuring promises to its customers saying the noodles are made with the best quality flour and has no additives in it. Its noodle making machine is direct from Japan while the noodle hand pullers and chefs receive training from a master in Japan (you can even see them pulling out the noodles in the kitchen). In addition, all noodles that have been cooked but not served within 15 minutes are thrown out for freshness. Big promises are also made about its ramen, the broth of which is said to take some 72 hours to make. The eatery's signs also promises it never uses MSG in their cooking, to cook to order all dishes and to abide by its operation hours. Certainly at a time when many restaurants and eateries in Seoul are cutting corners in all sorts of manners, the various promises made were quite reassuring. 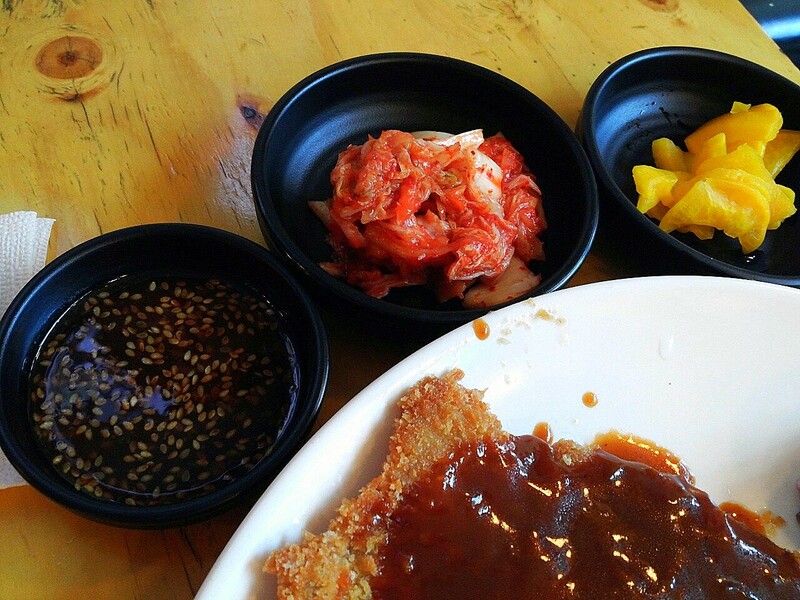 Aside from lunch on weekdays, the various donkatsu run between 8,000 to 11,000 won. 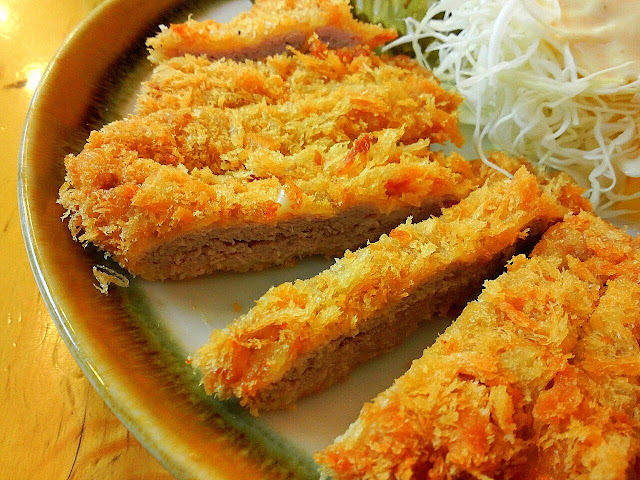 In addition to the wang donkatsu, other variations served include a special "salad" donkatsu", cheese donkatsu, fish katsu, etc. The ramen come in different levels of heat and in either regular or seafood. 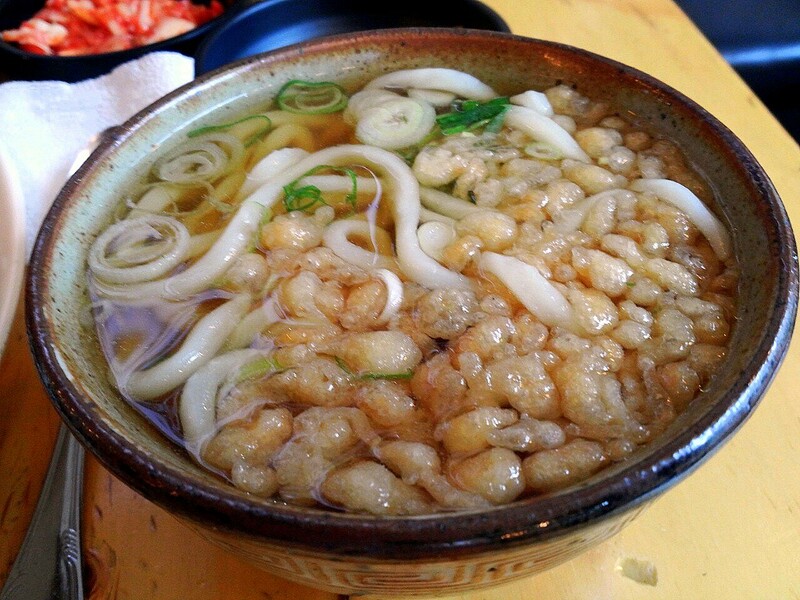 Udon comes in regular (sanukki) or 튀김우동 (tempura). If you're with others, an option might be to order from the various sets in which different donkatsu are paired with a mini ramen or udon. Sets are all between 11,000~12,000. For our first day here, I ordered a regular donkatsu and ramen set while my roomie went for the wang donkatsu and udon set. 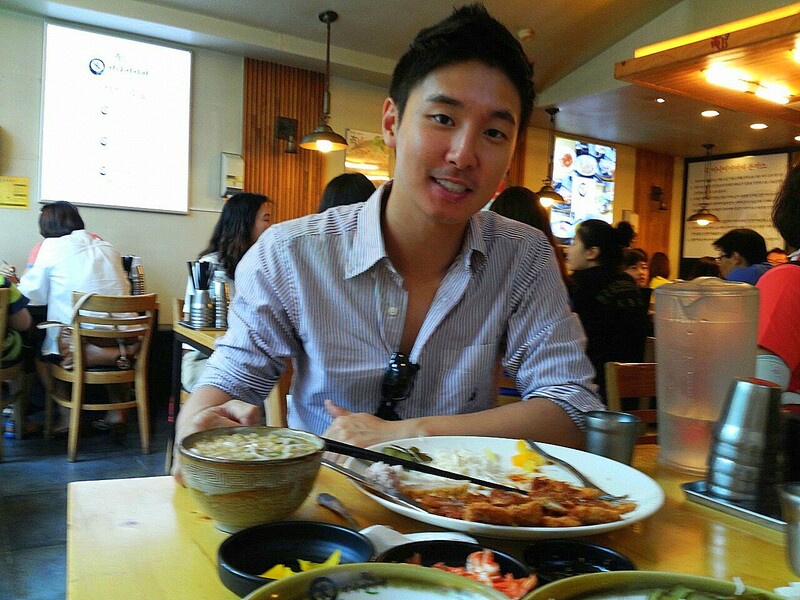 Like most donkatsu places, the first thing to arrive was the small bowl of corn soup. I doubt there's many nutrients in it but darned if it's not so tasty to eat beforehand! 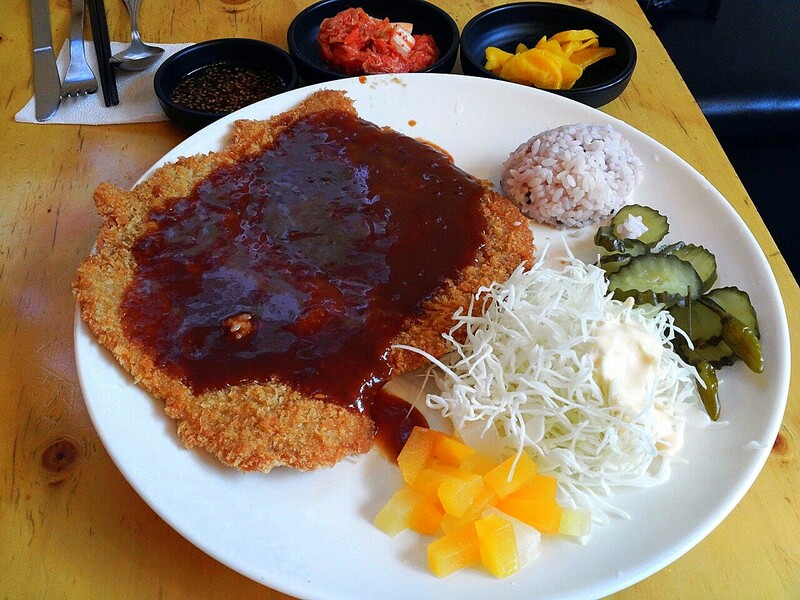 First to arrive for our main dishes was the humongous wang donkatsu. Accompanying it was a small bed of cabbage salad, pickles, a (seriously) small lump of rice and some fruit cocktail. 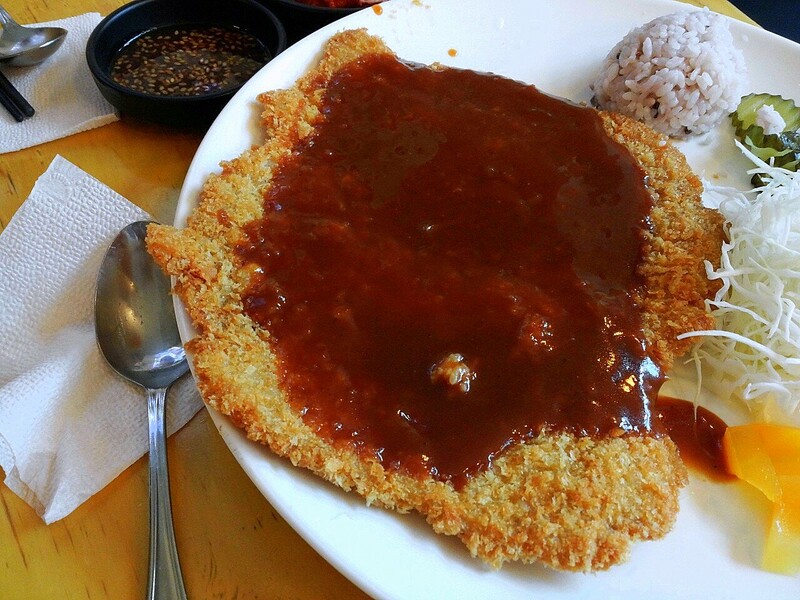 Unlike regular donkatsu, wang donkatsu comes uncut and always with the donkatsu sauce served atop it. The popular method to eat it is to cut, cut and cut the big slab into little squares all at once before enjoying. Coming up next was my regular donkatsu which was also served with the same accompanying sides. As you can see, not only is the regular donkatsu pre-cut but visually one can immediately note the differences. Thicker cut of meat, smaller size overall and bigger bread crumbs (panko). The sauce is also a bit different being thicker, mixed with sesame seeds and has a stronger taste. I liked my thicker cut donkatsu which had a nice ratio between the thick meat and its crunchy panko breading. Just enough bite when you first bite into it with pleasant chewing. No unpleasant taste or scent in the meat while the sesame donkatsu dressing served on the side was delicious as well. The wang donkatsu was pleasant enough and you could tell they definitely had cooked it to order as it didn't taste like stale frying oil like it often does in other places. I preferred, as usual, the thicker regular donkatsu but on freshness and taste alone, the wang donkatsu certainly didn't lack in anything and my roomie also gave it his thumbs up. With regards to the noodles, the first to arrive was the ramen. The noodles sat clustered around a pool of milky white broth and a good dose of sprouts, chopped scallions and sesame seeds on top. Gari (pickled ginger) is a big favorite of mine and the small slices on topped offered a great sharp contrast to the broth. The noodles was perfectly chewy with just enough bite and the veggies on top were quite fresh. 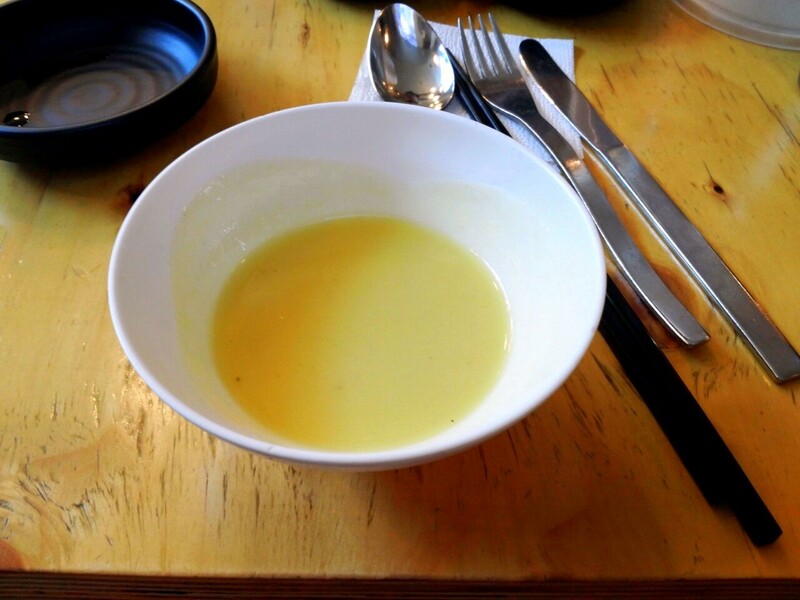 I can't say the broth was as impressive however. It wasn't anything terrible or anything but for all of Minamiya's hype about its arduous broth making process, it just seemed to lack a little something. 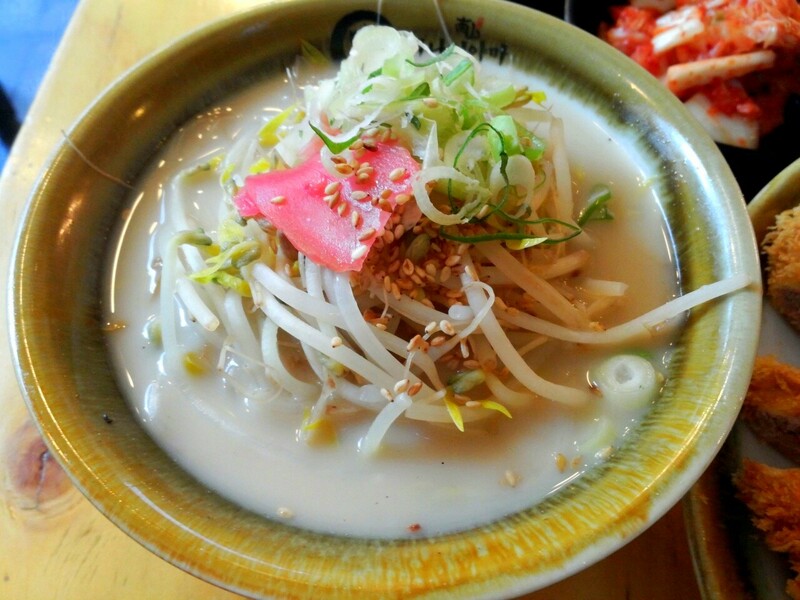 It certainly can't compete with the richer broths of other ramen-specializing places around Seoul. For all the ramen's disappointments, however, the udon was stellar. Clean and deep are the words I would use to describe the taste and I was reminded of the several memorable bowls of udon I enjoyed during my random times in the past in Japan. Unlike ramen which has a broader range of flavors and tastes, udon is simpler in comparison but one shouldn't mistake it as a simple taste. At first taste, you get a taste of good, pure stock, but that's soon followed by a deep and full-bodied flavor which can only come from care and attention. The noodles were again, superb and fresh. Dense, when picked up with one's chopsticks, and shiny and sleek on the outside but with a good chew. 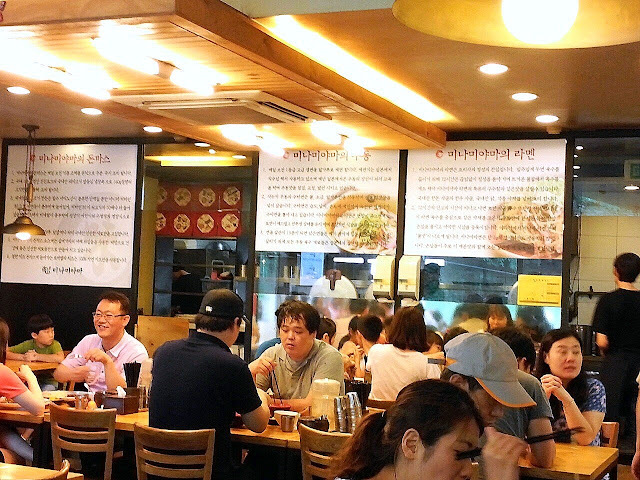 When a place is serving dishes commonly found from one's neighborhood kimbap chain store, it's easy to have low expectations in quality and taste in other places specializing in the dishes. But as places like Minamiyama proves, when attention is made in what goes in one's dishes, the quality of the ingredients and the process, even more common foods like donkatsu and ramen can really shine. Either donkatsu (regular or wang) I would recommend based on one's preference and I would also recommend the udon. The ramen I would say skip although I haven't tried the other variations so I can't say anything on them. Some of the other reviews seemed to say the seafood ramen is quite good. With so many places, however, specializing in donkatsu, I can't go as far as to say this is one of those places you need to go out of the way to come eat at but if you're within a few kms and in the mood then definitely go! It's also a versatile place that should leave you and your party (whether it's with friends, lover(s? ), and/or family) all quite satisfied. Alcohol: The Namsan branch has beers on top while branches like the Seoul branch seems to even serve sake. Tip: Lunch menus during the week start from only 8,000 and can also be ordered for take out. Some of other branches like the Seoul Station branch seems to also operate as an izakaya and even serving sushi and other eats. In addition to the original Namsan branch, there's a Seoul Station branch and a Namyoung branch (near Sookmyung Woman's University station).